Here are the campaign images for Spon Diogo's spring/summer 2011 collection entitled 'DISPLACEMENT'. The photos have been shot by Isa Jacob and feature model Mathilde Stephensen. 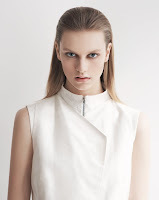 Styling has been done by the designers Mia Spon and Rui Andersen Rodrigues Diogo.